How do I Order a Funeral Program Template? You may order by clicking on ‘Add to Cart’ on the template product page. The cart is located at the top-right section of the page on desktop, and at the center-top of the page on mobile devices. You may choose to continue shopping for more templates or checkout via PayPal or Credit Card. PayPal is the most secure form of online payment. You do not need to be a current Paypal member to place an order. How do I download my template? 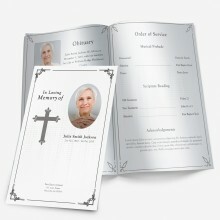 Upon purchasing the funeral template, it will instantly be e-mailed to you. Please check your spam/junk folder in case you don’t see it in your inbox. What is a customization service, and how long does it take? The customization service allows you to relax and let us make the funeral/memorial program for you. All we require from you is the photo of the deceased loved one and any content you would like inserted into the template, such as the funeral or memorial location and time, obituary, poem,etc. You would receive your template completely print-ready, which you can print from the comfort of your own home, or simply head over to your local office supply shop with the file and let them know how many copies you need. If you chose the option to have your template customized by us,the average wait time is less than 2 hours(unless ordered early morning hours). Delivery of your template customized is guaranteed on the day of order, or else it’s free. For this to apply, order must be placed at 3 hours from midnight at the latest. You will instantly be e-mailed a copy of the template you ordered because that is how our delivery system is set up. This is not your customized template. However, you may choose to get familiar with it if you’d like before your personally customized version is sent.